I've been possessed of a desire to re-watch the entire Babylon 5 television series of late. I have not seen a single episode since that groundbreaking series completed its tumultuous run, and am curious as to how well the epic, 5-year story arc holds up more than a decade later. But to up the ante, I've invited my teenage daughter, Calista, to watch it with me. She was just a few days old when the final episode aired back in 1998, so we'll get an unbiased take from a hard-to-please Doctor Who fan who is fairly well-read when it comes to modern YA science fiction. Does J. Michael Straczynski still have the touch? Come along with us and find out. Note: We watched the 1998 edit for this review, which, while still problematic, is an improvement over the version that originally aired. In Valen's Name: The Babylon 5 space station, commanded by Jeffrey Sinclair, has been operational for one full year. It is awaiting the arrival of the ambassador of the mysterious, ancient and powerful Vorlon Empire. After a ruinous war with the Minbari that nearly drove the human race to extinction, the Babylon project was conceived as sort of diplomatic meeting point to prevent future conflicts. Babylon stations 1-3 were sabotaged and destroyed during construction. Babylon 4 mysteriously disappeared 24 hours after going operational. Babylon 5 was only completed after the Minbari and Centauri Republic provided assistance. The main alien races represented by ambassadors include the bald, zen-like Minbari, the foppish, crazy-haired Centauri and the antagonistic, reptilian Narn. Other minor species are present in the loosely-affiliated "League of Non-Aligned Worlds." As the Vorlon ambassador, Kosh, arrives, Sinclair is inexplicably delayed in meeting him. When he arrives, Sinclair finds the Vorlon collapsed, the victim of an assassination attempt. Doctor Benjamin Kyle opens Kosh's encounter suit despite Vorlon communications against doing so in an attempt to save the ambassador. Also in defiance of Vorlon demands, human telepath Lita Alexander enters Kosh's mind to find out what happened, and sees Sinclair attack the ambassador with poison. The Vorlons send a fleet of warships to take Sinclair back to their world for interrogation and trial, but Sinclair figures out the assassin was using a "chameleon net" to alter his appearance. They corner the assassin, who is growing more desperate, and discover he is actually a Minbari who utters a cryptic comment to Sinclar--"There is a hole in your mind'--before blowing up a large section of the station and killing himself in the process. The Vorlons monitor the incident and depart, content that Sinclair is innocent. What Calista Says: The first thing that struck me while I was watching the Babylon 5 pilot was the really sucky special effects. The second thing I noticed was that the Asian lady couldn't act. My favorite character was probably the telepath, and my favorite aliens were the ones who used to be at war with Earth. I really want to know more about them. The aliens with the flowery space ship reminded me a lot of Time Lords for some reason. What Jayme Says: The Babylon 5 pilot, "The Gathering," isn't awful, but lord it isn't good. The CGI effects are primitive even for 1993, and the narrative is ponderous and slow, seemingly lingering over sets and costume design and prosthetic makeup to show the viewer how much was invested in the production. The acting--particularly by Tamlyn Tomita as second-in-command Laurel Takashima--is stiff and wooden. The assassination plot should've been a taut thriller, but is flaccid and offers little in the way of making viewers care. There are several reasons for these shortcomings, foremost of which is the fact that series creator J. Michael Staczynski (JMS) had never served as a show runner before, and made a lot of mistakes his first time out. The other reason is that several years before, JMS had pitched Babylon 5 to Paramount, which took copious notes and proceeded to incorporate many of the key elements into the new series Star Trek: Deep Space 9. The fact that Minbari were originally conceived of as shape-shifters forced the stop-gap measure of inventing the "chameleon net" technology when DS9 introduced shape-shifters as major characters in the pilot. Not to mention several other integral concepts. Re-tooling the pilot script did not help the production find its footing. And if I'm going to get down amongst the weeds on this analysis, the Minbari makeup is a bit too latex-heavy in the pilot, and the androgynous look, while an interesting experiment, is somewhat awkward and off-putting. The revisions made for the regular series are a strong improvement. And there's one awkward scene where Minbari Ambassador Delenn gets into it with Narn Ambassador G'Kar, where she subjugates him with a "gravity ring." For real. This gravity ring is one of five color-coded rings Delenn keeps hidden in her quarters, and when I saw this, I immediately thought that J.R.R. Tolkien left out one verse about "Five rings for the Minbari Council in the robe of grey..." The concept is silly, doesn't work and is thankfully never mentioned again. Vorlons also get short shrift here. Everyone goes around making noise about how ancient, mysterious and powerful the Vorlons are, but they're just a threat on paper that goes away at the end without so much as a peep. Rewatching this sequence having knowledge of what happens in season 4 casts an entirely new light on the peril of the situation. But then again, the same can be said of pretty much everything in the first season. Despite the problems, it's hard to overstate the importance of this film. I remember some buzz among the fan communities I was connected with, and while nobody fell in love with it right away, it intrigued folks with its potential and they wanted to see more. Remember, Star Trek was the only game in town for unabashed space-based science fiction, and the ideas in Star Trek had so permeated pop culture that science fiction television had a sort of homogenous default to the Trek model. 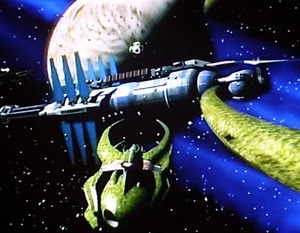 Babylon 5 attempted to create something distinctly different, and at the time, some Trek fans too offense and viewed it as a threat to their beloved franchise. JMS was attacked on message boards and one person went so far as to email him a virus disguised as a drawing of a Starfury by his child, which corrupted several scripts JMS had on his home computer. There was also a character arc involving Takashima being compromised and possibly corrupted--she covertly aided the assassin, although that isn't readily apparent in the pilot--that went out the window once Tomita was replaced by Claudia Christian on the show, but that's for the best considering how great a character Ivanova became, and how stilted Tomita was in her one appearance. Doctor Kyle didn't make it past the pilot, replaced by Dr. Stephen Franklin, and telepath Lyta disappeared from the series as well, although she would return later on. The look of Babylon 5 is different from Trek and other SF predecessors, and there's a more complex dynamic at work with the various races present. There are also hints at a complex back story, but at this juncture, there's little to indicate just how rich and distinctive this series will become. As part of the series proper, "The Gathering" is as close to disposable and irrelevant as it gets.